The Big 6-0, it's time to celebrate! 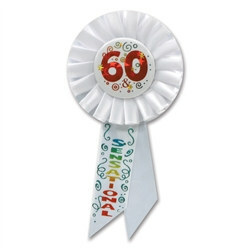 The 60 and Sensational Rosette Ribbon is just what you need to get the party started. Each ribbon has brilliant red metallic 60 in the center of the ribbon. On the tail of the ribbon is the word sensational in multicolored lettering. These ribbons are sure to please anyone who is turning sixty at their birthday party. Make sure to not forget the 60th Birthday Confetti and 60th Firework Stringer.